The winter blues. OK scratch that. We haven’t really had much of a winter here, but it’s gone back to the weird, annoying cold weather. I swear, one day it’s in the mid-40s and the next it’s in the 20s. It’s also sad that I find 40-degree weather to be warm. Ah, Michigan. So because of the cold we had today we decided to make a nice grilled dish with a side salad that just screamed summer! So this site had a recipe for grilled tofu and a chopped salad so we decided to make it! There’s a whole marinading process, which really didn’t make sense to me since we weren’t cooking meat. I think if we hadn’t done that, it would have been fine. We probably could have just made the sauce and brushed it on as it grilled, but hey! What do we know? I was mostly excited about the grilling part. I love grilled anything (well vegetarian anything). We used our panini pan (the bottom part) instead of busting out the huge grill pan. It worked like a charm! We also only made half the recipe, but I’ll leave the steps for the whole thing since you can use the same amount of “marinade” for two pieces of tofu as you would with four. Patience is a virtue. But waiting for grill marks is a beautiful thing. The more you know. And can I just mention the salad we had with it? It was simple, delicious and light! Like I said, summer on a plate. Om nom nom. Give this a try if you love tofu! I’m sure you’ll love it! Oh and the best part? This entire meal is right around 300 calories! I kind of wish I had made all of it. Would have made for a great lunch tomorrow. Blast! Seed both the tomatoes and cucumber and cut into bite size pieces. Put them in a bowl, add the parsley, scallions and sliced kalamata olives. Add the olive oil, white wine vinegar, salt and pepper, toss lightly, cover and refrigerate for about 30 minutes (or longer if you want). I think the longer it sits, the better it tastes so the flavors have time to develop and become delicious! Next in a shallow bowl, whisk the lemon juice, olive oil, garlic, oregano, salt and pepper until combined. Stand the tofu block on it’s side, and cut crosswise (lengthwise) into 1/2-inch cutlets. We only used half the block so we had two pieces. You could cut all of it into four pieces and make it all if you want. Take the tofu and put it into the marinade coating each side. Cover and let it refrigerate for 15-20 minutes. When it’s time, get your grill pan screaming hot. We just sprayed some non-stick spray to the pan, let it get hot and then put each piece of tofu on. Grill on each side for 5 minutes on each side. You can brush on the remaining marinade every few minutes to help create more flavor as it grills. Serve with the salad and enjoy! Do you ever make summer-themed dishes in the winter? This entry was posted in Food, Main Dish, Salads, Vegetarian and tagged grilled tofu, kalamata olives, lemon, mediterranean salad, summer, vegetarian on February 8, 2012 by Aparna B.. Warm goat cheese salad. It was our favorite thing to eat at the Café Bosquet in Paris during our honeymoon. We’ve made this before, but we revisited it tonight and OH. EM. GEE. I won’t lie, it turned out even better. And tasted even better. So I thought it might be nice to re-post the recipe with the changes we made! I think we nailed it this time. The minute I tasted it, it was like I was back in the 7th district, as cheesy as that might sound (no pun intended). Slice a French loaf and cut the long pieces into squares. You’ll need to use the goat cheese to know how big the bread should be. We used a French loaf, but you could probably use sourdough or something similar. I think sourdough might be too…well…sour with the goat cheese and dressing. So I bought these two big rounds of goat cheese. You could use a smaller round, what ever works. These were big, so we cut them each in half, length-wise. Be careful and try not to crack it. We didn’t succeed as you can see, but it still worked out. Toast the bread. Ours was able to fit into the toaster, which definitely helped. Don’t let it get too dark though since it will continue to brown and toast in the oven when it bakes with the goat cheese. In a Pyrex measuring cup, combine the mustard, apple cider vinegar, red wine vinegar, salt and pepper. Then whisk in the olive oil and mix until it’s smooth. Dress your salad mix lightly, toss and set aside. Drizzle each piece of toast with a little olive oil and use 1 tablespoon of honey total to drizzle between all the pieces of bread. Then place one piece of goat cheese on each slice of bread. Once you’ve done that, top each piece of goat cheese with 1 tablespoon of honey and spread it out. Bake in the oven, on the bottom rack. This is important because on the top rack, it’ll get to hot and just fall apart. This way, the heat is still there, but it’s not direct. Place on the bottom rack, close the oven and bake for 5 minutes. After that, turn the broiler on, and leave the oven door slightly open (most oven doors can do this) and let it broil for 2-3 minutes. Keep an eye on it so it won’t burn and/or melt too much! What you’ll see is pure magic: the honey starts to harden and turn golden and the goat cheese firms up but still melts. The toast gets a bit darker too. The whole thing is done when the goat cheese is golden on top. Place the piece of toast and cheese on your salad and serve! We had ours with a dry, chilled Sauvignon Blanc with hints of citrus. It tasted really good with the salad! I’m a bit “wine-pairing” person, but I could tell the wine made the dish a little sweet which was delicious. Have you ever re-visited a recipe you’ve made in the past? Did it turn out better or worse than the first time you made it? This entry was posted in Food, Main Dish, Salads, Vegetarian on January 21, 2012 by Aparna B..
I’m hanging on to every ounce of summer. I love fall, don’t get me wrong. It’s my favorite season, but there is one thing I absolutely love about the summer. I love eating fresh fruit and vegetables, but I especially love it in the summer time when you know it was grown fresh near you. So delicious. REB and I went to one of our favorite restaurants in town, Zingerman’s Roadhouse and I had the most amazing salad there. They feature it on their summer menu each year, and each year we’ve gone, they’ve been sold out of it! So when I found out it wasn’t sold out, I had to have it! It was just as delicious as it sounded and was described to me. And it was light! I recreated the dish after figuring out what ingredients they used (and what I could taste). I can in no way take credit for this dish, and I know it isn’t exact, but this variation was just as delicious. And the secret? Heirloom tomatoes!! What I found best was to let the bread sit for a day or two, then cut them into 1-inch pieces (you’ll only need about half the loaf). Place on a cookie sheet, drizzle with olive oil, toss and bake for 10-12 minutes or until golden brown and toasted. I’m not sure if this is what Zingerman’s did, but I figured if it was fresh bread, it would just fall apart with the dressing. By toasting it lightly, it kept its shape and still sopped up the delicious dressing. In a large salad bowl, add tomatoes, mozzarella and cucumber together. Add the capers, vinegar, olive oil, salt and pepper, basil, and toss well. Add the bread in last, toss lightly. The heirloom tomatoes do it all for me. No, scratch that. The capers. I love capers. I could eat capers all day long, I love them so much. But the tomatoes are the star and they are so juicy and delicious. Drizzle olive oil on top before serving and enjoy! This entry was posted in Food, Main Dish, Salads, Vegetarian and tagged apple cider vinegar, balsamic vingear, basil, capers, heirloom tomatoes, mozzarella cheese, olive oil, salad, sourdough bread, tomato bread salad, tomatoes, vegetarian on August 23, 2010 by Aparna B.. I might be one of the only people who doesn’t like bleu cheese. I mean, I don’t hate it, but I prefer other cheeses. Give me cheddar, mozzarella and gouda any day over the bleu. When I ate meat, I was the girl who dunked her Buffalo wings in ranch. Bleu cheese is just so pungent and sour-tasting. For some foodies, they can go on and on about how it “melts” and “crumbles” and the “tang” can be the element that makes the dish. Not for me. I never could wrap my head around eating a food that has mold on it. 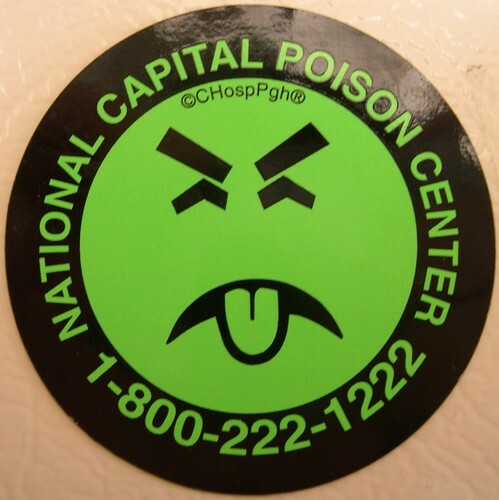 When I was younger, my mom would put Mr. Yuck stickers (remember those? If not, this might jog your memory) on things I shouldn’t touch or eat. OK, maybe it was used for poison and not bleu cheese, but still. Maybe she should have put it on that cheese because it has mold on it…and mold is bad, right? Right?? I was told it was. Apparently not, though, because many people devour bleu cheese on a daily basis. REB, B, JoP, and many other friends of mine looooove bleu cheese. I know for a lot of recipes melting it over meats or vegetables is the way to go. And yes, in the past I was lectured by my roommates on how Buffalo wings just aren’t the same unless eaten with bleu cheese. I may not be joining a 12-step program to accept this cheese, but I am trying to open my palate to it (in moderation, of course). 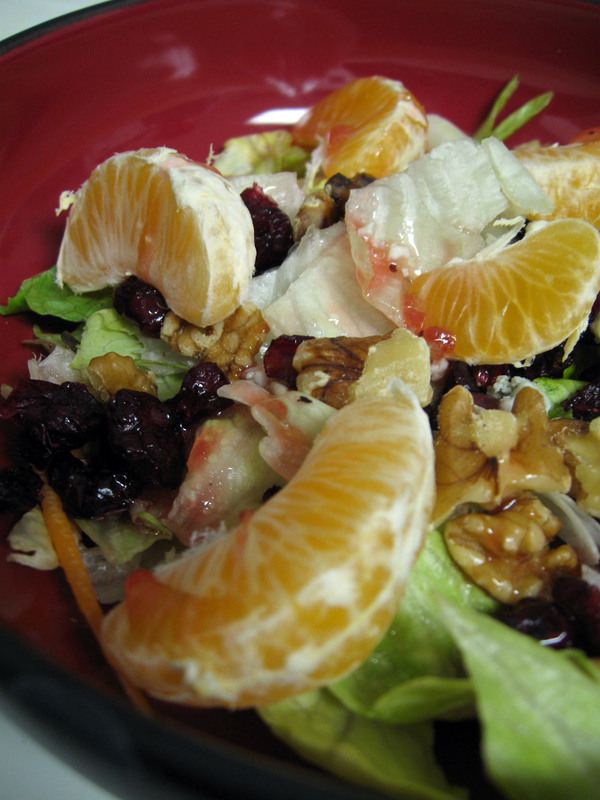 Yesterday I made a harvest salad (We call ‘em Michigan salads here) with field greens, dried cranberries, walnuts, raspberry or balsamic vinagrette and…bleu cheese. I ate the salad and when I was finished, looked down in my bowl and saw that I ate everything but the bleu cheese. There was a beautiful pile of them on the bottom of my bowl. I made the same salad tonight…. 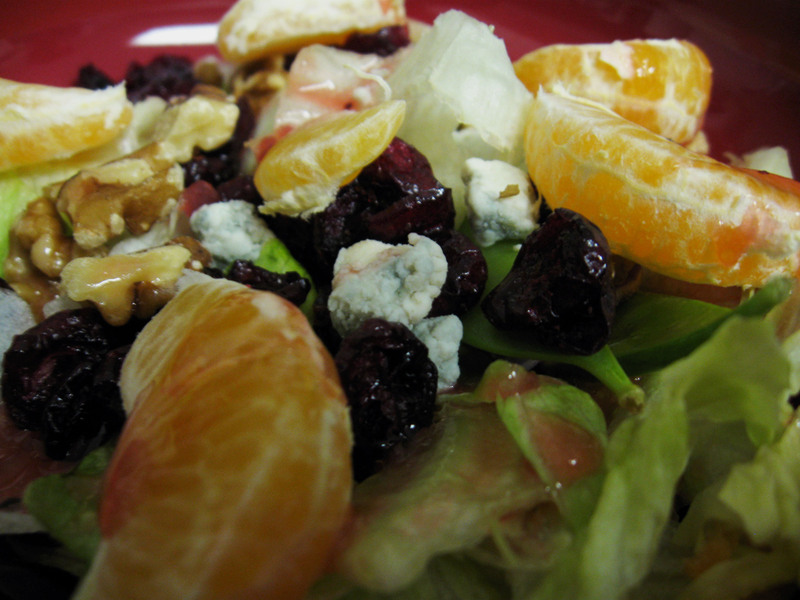 This entry was posted in Food, Salads, Vegetarian and tagged bleu cheese, Food, salad on January 7, 2010 by Aparna B..